Following a few queries about having a 6 digit cusip and requiring a 9 digit cusip. If you have 6-digit cusips for US companies and want to translate to 8 or 9 for use with CRSP and Compustat you can use WRDS. 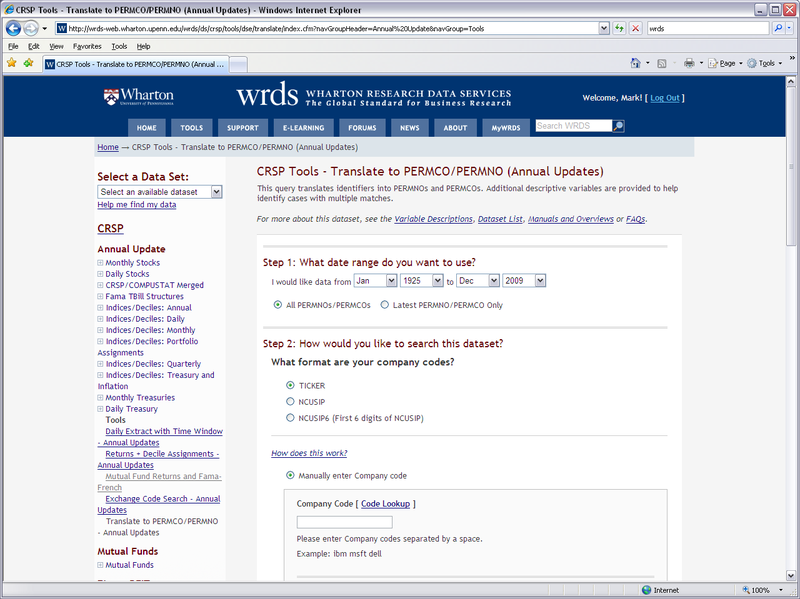 Now that you have a PERMNO (or PERMCO) you can use this to access CRSP. CRSP – CRSP/COMPUSTAT Merged – Linking Table can be used to convert a PERMNO into a GVKEY (S&P identifier) and a 9-digit cusip. You can choose “Use Unique link…” in the linking options, and “Historical CRSP PERMNO Link to Compustat Record” and all the identifying information. An alternative for getting the 9th check digit is to use the WRDS CUSIP database. CUSIP – Issuer query : provide 8 digit cusips, ask for “cusip check digit” and concatenate to convert 8 to 9 digit. The CUSIP – ISSUER query can be used to convert 6 – 9 digit cusips by getting the issue number, finding the one with “Description 1” as “COM” and concatenating the issuer no, the issue no (almost always 10) and the check digit. If this doesn’t work the 6 digit CUSIP is probably not for a quoted company covered by WRDS – try their code lookup facility (on most search pages). This blog is a free wordpress.com blog – hosted by wordpress – hence the occasional adverts on the most popular posts. To convert/transfer GVKEY (S&P identifier) to CUSIP you can use WRDS Compustat North America Fundamentals Annual – choose GVKEY as the format for your company codes and select CUSIP (from Identifying Information) to be included in the results. what if the CUSIP is a 5-digits number? I find this approach is more efficient than crsp cusip tool. Could you further explain this approach? Thanks! May I ask why for the same permco, there has two or more different ‘cusip6+cusip2’ numbers? I trace back to their corresponding returns (from CRSP) for each ‘cusip6+cusip2’, and find the returns are different for the same day for the same permco. I thought that for the same company the stock returns should be the same on the same date. It is possible for there to be more than one “cusip6+cusip2” numbers for the same company (same permco), for example if the company has more than one type of shares. Strictly the stock returns are for the company stock (or issue) rather than the company but this distinction can be safely ignored when there is only one stock issue for the company. To investigate further I’d have to have a specific example. i have the data from SDC, where different firm names have same 6-digit cusip number. So does this mean the same firm? Thanks. i also have another question.Does all the 6-digit cusip can be changed to a gvkey using above way? i input about 600 6-digit cusip in, but only get about 200 gvkey. How can i get the remaining. Thanks. You could use WRDS – CRSP/Compustat Merged (CCM) – Linking table to download a spreadsheet containing gvkey (S&P identifier), cusip, permno, and ticker. Then write a program to match your 600 6-digit cusips with the first 6 digits of the downloaded 9-digit cusips. Of course this only works if your companies are covered by CCM – all listed NYSE, Amex and NASDAQ common stocks.